This entry was posted on Monday, August 13th, 2007 at 2:39 pm and is filed under Uncategorized. You can follow any responses to this entry through the RSS 2.0 feed. You can leave a response, or trackback from your own site. Yo. Nice pic. I liked the ones on Flickr, too. That site’s blocked at work, so no lunch hour enjoyment of those pics for me. 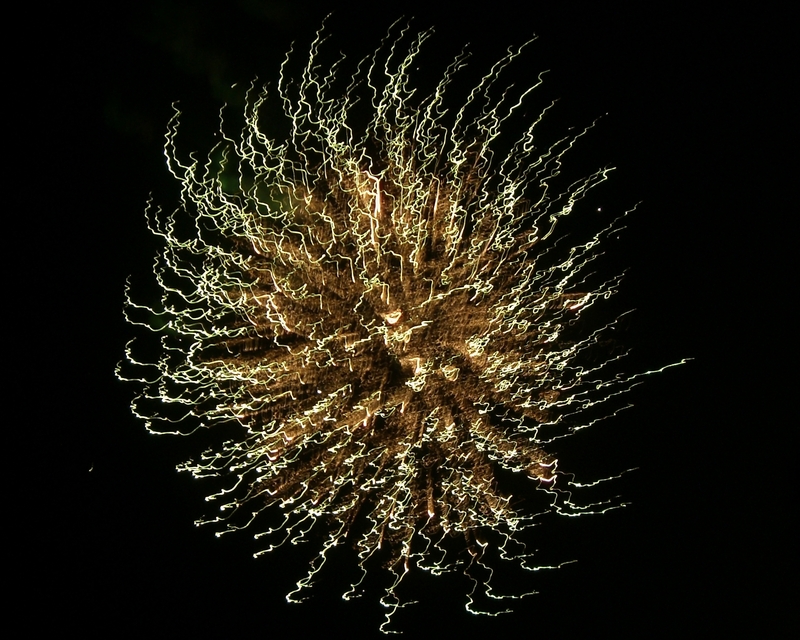 Very cool effect on the fireworks, with the camera movement included. Thanks, especially, for the one of me trying to handle that massive (and wonderfully delicious) corn dog. I may or may not have dropped it on the bare grass and then wiped off the mustard that had grass in it before eating the entire thing. Hey, I’ve been backpacking, and eating is not always a perfectly sanitary affair. Probably cleaner off that open field than off the average kitchen floor. Right? RIGHT?!! Great Picture – and yes I can see the Surfer, but also looks like an “Angel” to me. Loved the pictures Juice took. I think Owen would really, really, really like one of those machine guns. Can’t wait until Rick gets home so I can shown him those. Like Grandfather, like Grandson? Wish we could have been there to share the enjoyment with you guys! Looks like Owen and Juice had a great time swimming too! Mark – I’m with ya on the corn dog. And sorry about the Flikr thing, wonder why I don’t have that problem. Mary Lou – I can see an angel too with the darker light making the wings. The lake was really nice. We both said we can’t wait to go back to some place like that really soon. VERY cool picture – I definitely see the “fire surfer”. Pretty good projection you’ve got going on there:). Also loved the pics from the lake and Independence Day celebration. A few cute ones from home too! We do love to see y’all having fun!